Reliance LYF Earth 2 Smartphone+ Hands On Review - A Mixed Bag Of Priorities. 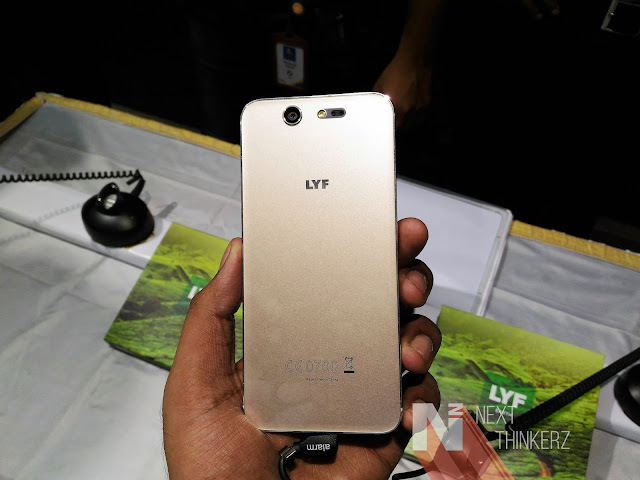 So on 27th June, Reliance unveiled their 2nd iteration of what they call as a flagship device, the LYF Earth 2. This press event took place at their very own Reliance Digital Store in New Mumbai. Reliance has had quite a huge success from the first generation of LYF devices, more so likely because of the JIO SIM connectivity. The JIO SIM card takes things to the next level with Unlimited 4G Data connection for the starting three months, no strings attached and Until you swallow that listen to this - later you can have 10GB for just Rs.93/month. This might be the primary reason why LYF Smartphones suddenly got a boost in Indian Market, Since the JIO SIM is exclusively available for LYF Smartphones. Which means the LYF smartphones have specific antenna bands inbuilt to catch the signal reception of a JIO SIM. 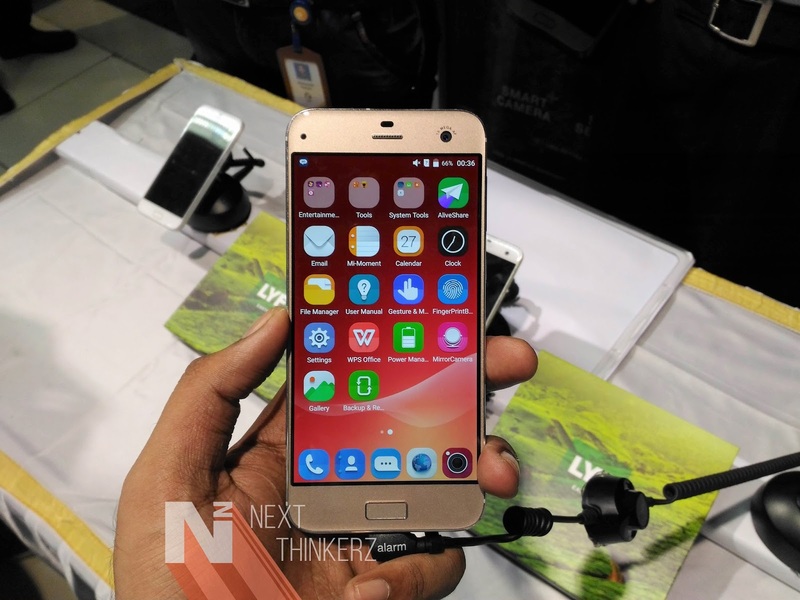 Today let's find out about their newest iteration, the LYF Earth 2 Smartphone+ in detail. LYF Earth 2 has 1.5 GHz Qualcomm Snapdragon 615 Octacore processor coupled with 3GB RAM and Adreno 405 GPU. It has a 5.5 inch 1080p Full HD IPS LCD panel giving it a pixel density of 445 PPI wrapped with Corning Gorilla Glass 3 protection. The display offers a 178° wide viewing angle. It comes with 32GB onboard storage, and it supports up to 64GB Memory Expansion via MicroSD Card slot. It sports a 13MP Rear Camera equipped with laser autofocus mechanism, whereas the Front Camera is also a 13MP Auto Focus shooter. There's an LED Flash present on the both sides. It is capable of recording 720p/1080p HD videos at 25FPS from both cameras. It has Dual SIM support with primary SIM capable of accommodating a 4G network, and 2nd SIM supports 2G Bands. Whereas it is VoLTE ready. It has a 2500 mAh Non-Removable Li-Polymer battery. It comes with a fingerprint sensor on the front, which doubles as a physical home button. It has support for 802.11 b/g/n WiFi & Bluetooth 4.0. Whereas we have a micro USB 2.0 connection port for charging and data syncing. Whereas it comes with Android Lollipop 5.1.1 preloaded with no words on upcoming updates, Mildly Coughs. Apart from that, it has all usual set of sensors that you find on any other device. Lastly, it is available in 4 colors - Green, White, Gold and Black. The Reliance LYF Digital store bloomed up by the presence of a well-known film director Punit Malhotra. Where he showed his latest TVC production by Dharma Productions, featuring Bollywood's pride Priyanka Chopra promoting the new LYF Earth 2 Smartphone +. The event had been streamed live on Reliance LYF's Facebook page to the millions of customers watching online. 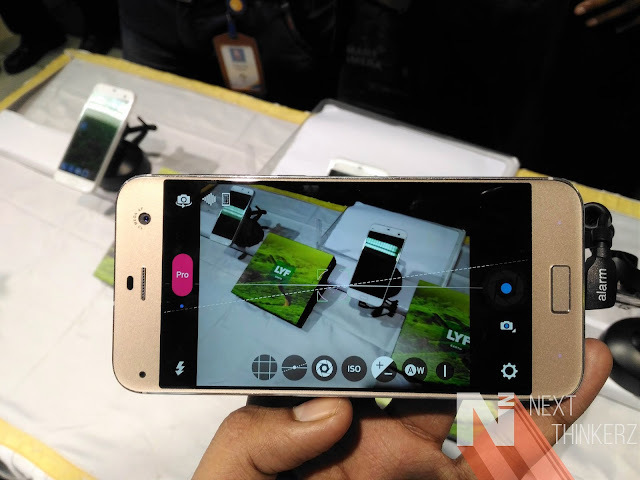 Reliance LYF Earth 2 Smartphone+ Launch Event. So what separates LYF Earth 2 from various other brands that offer a similar set of specifications? So LYF Earth 2 Smartphone+ offers a PRO Mode(manual mode) in camera app which is great to take your smartphone photography to the next level. Everything from controlling ISO to shutter speed is available & the added laser autofocus mechanism helps in snapping pictures at a faster standard. We saw that it also supports voice commands to click photos quickly, even commands to switch from primary camera to selfie shooter are available. Commands like 'Selfie', 'Smile' & 'Capture' do the job of snapping pictures. Upon our personal use, it worked 7/10 times, though we were in a noisy environment. These features can be pretty handy if you're taking, let's say a group selfie - where it's difficult to reach the camera trigger. Apart from the usual fingerprint sensors applied these days on several devices, we saw that LYF Earth 2 has something different to offer here with the new Retina unlock. We didn't get a chance to try this at the event, but during the demo it did seemed high at initial impressions. The fingerprint sensor option embedded in the Android ecosystem allows you set different fingers to initiate different applications with just a touch, even from the lock screen. It also comes with the functionality to encrypt your photos and videos in the gallery app, which is only accessible when you authenticate yourselves with your fingerprint. Same goes for several applications; Since everything happens in the background, you don't notice anything. Whereas there are about 19 different gestures that can be assigned to launch specific tasks/apps upon personal preference which has been indicated as Smart+ Sense. Reliance LYF Earth 2 Smartphone+ Final thoughts. The LYF Earth 2 has an ergonomic design with 2.5D curved glass, which makes the device feel premium in hand. 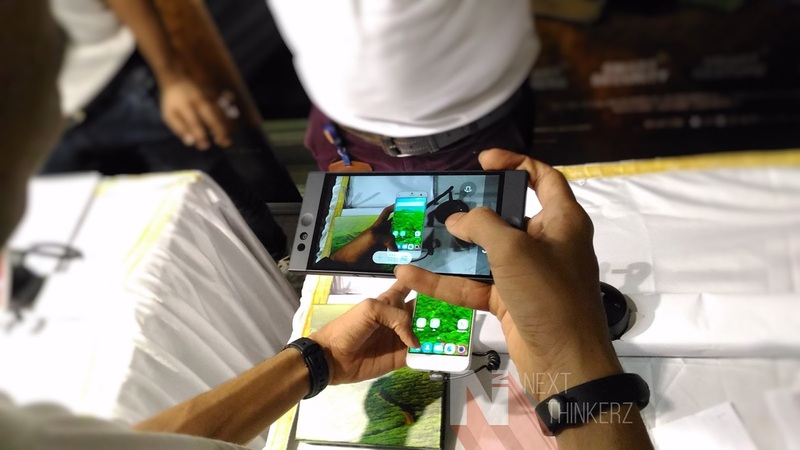 We were drooled over the design of the LYF Earth 2 & wanted to play more with this device. Let's see how it evaluates with time & excels concerning sales. Although the pricing revealed at the event was Rs.21,999, Then it was stated it costs Rs.20,999. But now their website claims that it is priced at Rs.19,999(Final Price), Strange!. But cloaking it together with JIO SIM's superior data plans, this device might just serve your thoughts. So LYF Earth 2 seems to be a mixed bag of interesting ideas for us, Make sure you subscribed to our Youtube Channel as we would soon upload the video regarding the same. You can register here to buy the LYF Earth 2.